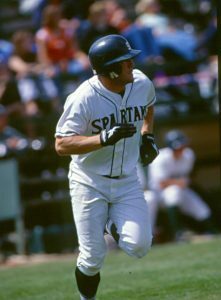 During his college days in East Lansing, it was the baseball diamond that made Chris McCuiston famous. But in his professional business career in metro Detroit, what drives his notoriety is the kiddie pool. 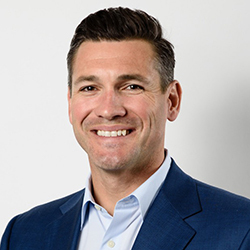 McCuiston (BA Finance ’02), who with his wife Jenny founded Goldfish Swim School in suburban Birmingham, was recently named to Crain’s “40 Under 40” list for 2018. It is in recognition of the example the former MSU baseball star is setting in using business to better the Motor City. The swim school has more than 80 franchises and roughly 1,800 staff members, and teaches more than 90,000 students each week. At MSU, McCuiston was doing his part to keep the Spartans afloat on the base paths. The centerfielder shared team MVP honors in 2002, when he was team captain and led the Big Ten in batting average (.404), base hits (93), runs batted in (71), and doubles (22). He was drafted by the Detroit Tigers in the 31st round of the 2002 Major League Baseball player draft. Whether in baseball or business, honors have followed the Eli Broad College of Business alum. Ernst & Young named McCuiston as one of its 2017 EY Entrepreneurs of the Year for the Michigan–Northwest Ohio region. The inclusion of Broad Spartans on the “40 Under 40” list is no surprise to Sanjay Gupta, dean of the Broad College. You can see the full list at Crain’s Web site.